Joyce Carol Oates, Ann Beattie, Diane Ackerman, and more explore the double-edged sword of curiosity . . . Curiosity is as central to life as breathing. And like breath itself, when it ceases, the vibrancy of life fades and disappears. Curiosity leads to discoveries both beneficent and, at times, destructive. It often occasions wonderment, but also terror. It prompts the precise scientist, but also the nosy gadfly. A double-edged sword, curiosity has forever held a crucial role in myth, literature, science, philosophy, history—nearly every field of human endeavor. While most of us know the old saying about curiosity killing the cat, we must also remember that “satisfaction brought it back.” Curiosity incites and compels, taketh away and giveth. In this issue, curiosity impels a personal assistant to learn hidden truths about her deceased employer—a famed playwright—and his relationship with the woman who directs an Italian arts foundation to which he donated his priceless library of first editions. A novelist, inspired by a different kind of curiosity, studies the traditional teachings of his Cherokee forebears after reading the notebook his beloved grandfather possessed when he died. Elsewhere, a young boy removes his clothes and, driven by dangerous curiosity, crawls into the gaping darkness of a sewer pipe, where he mysteriously vanishes, altering the lives of everyone who knew him. While most of the stories, poems, and memoirs here investigate the places where curiosity transports us—from forgotten burial grounds to natural history museums, from alluring lakes to postapocalyptic seaside shanties—A Cabinet of Curiosity also features a singular visit to an archetypal curiosity cabinet in Amsterdam with its treasury of specimens, of oddities in jars and on shelves, of things pinned and things afloat. Curiosity in all its guises is the wellspring of revelation. It is a prime mover behind our deeds, good or evil, simple or complicated. While the thirty-one writers gathered here individually explore many of the ways in which curiosity drives and defines us, together they propose that the realms of curiosity are, finally, inexhaustible. 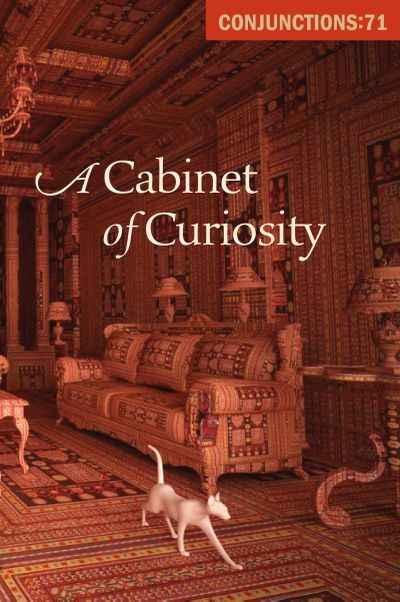 A Cabinet of Curiosity includes contributions from Laura van den Berg, Ann Beattie, Brandon Hobson, Eleni Sikelianos, Greg Jackson, Julianna Baggott, Jeffrey Ford, Joyce Carol Oates, William Lychack, Joanna Scott, Catherine Imbriglio, Dave King, Lauren Green, Can Xue (Translated by Karen Gernant, Chen Zeping), Nathaniel Mackey, A. D. Jameson, Quintan Ana Wikswo, Lynn Schmeidler, Samuel R. Delany, Kelsey Peterson, Sarah Blackman, Gerard Malanga, Martine Bellen, Maud Casey, Gregory Norman Bossert, Stephen O’Connor, Matt Bell, Madeline Kearin, Bin Ramke, Diane Ackerman, Elizabeth Hand.